Sorry I will be away until mid February for job with Shintaro-nii, it's about a job regarding Japan hehe..
Hopefully it's all done nicely! This year I'll graduate so I've been busy working on my stuffs to prepare my future career. Maybe I should write a blog post about this too later on.. 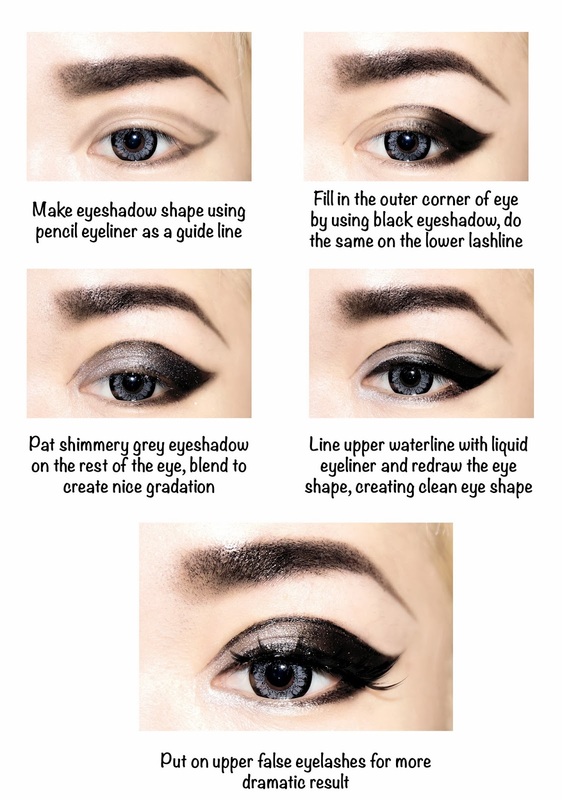 But anyway, here's another make up tutorial for you! Turn out, it's so fun to do! And I kinda look vampire-is too hahaha! This make up is super bold and strong and it breaks all my make up rules so far. Usually I only focus on one area as main focus, but this time it has strong eyebrow, eyes, and lips! Well at least I don't put any blush to create vampire-ish look! I feel like I have found a new me!! 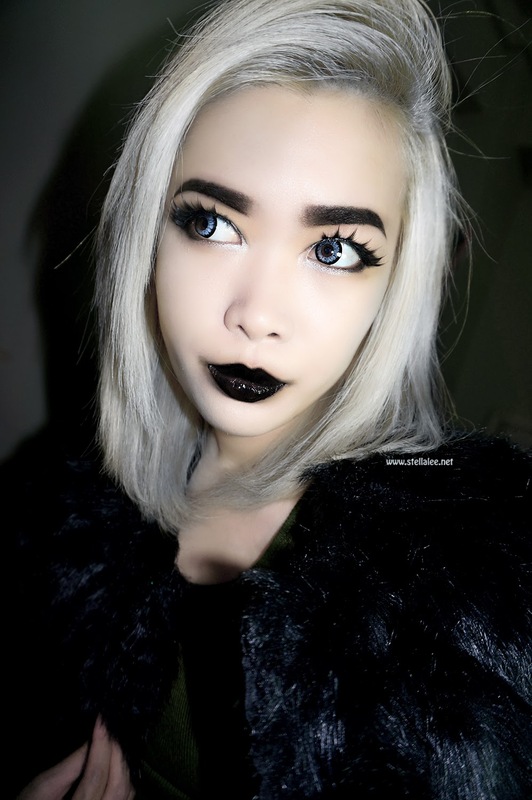 Hahaha..
To be honest, this is my first time trying on black eyebrow on light pale hair. Usually I always AVOID it, but now it turns out edgy!! Do you guys like this look on me? Get yourself done this too and tag me so I can see your creation! Actually, I like the brown better than blonde. That wig is natural and cute! Wow looks so pretty! It's simpler than I thought and you pull off this look really great! OMG I thought it was not you >< awesomeeee! Rambutnya di cat stel? Cocok loh abu-abu gini warnanya. Maybe you should play with bold color now <3<3 love it! 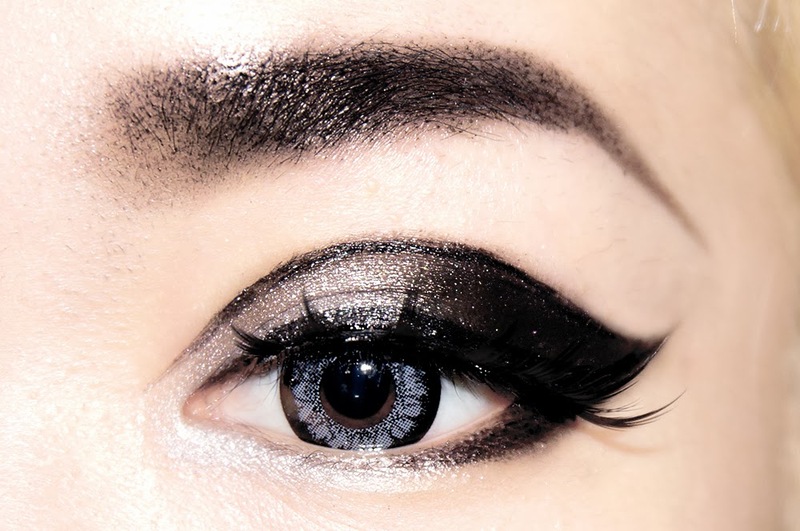 omg, this is so different from your other tutorials/makeup look :O You're so awesome !!! anyway, the hair, makeup and outfit are totally match~ it does give me impression like, woah stella looks like an international artist from a movie xD hahaha. You look AMAZING. I seriously love this side of your blog. :) Darker edgier look always works on you, and I am amazed how good the black eyebrows work with light hair! I saved the picture to my computer for inspiration. :) What contacts are those? Did you use eyeshadow for lips? i love this! great job making your eyelids look a lot bigger than they are. beautiful beautiful job! keren to the max tell!!! omg this is so amazinggg *. 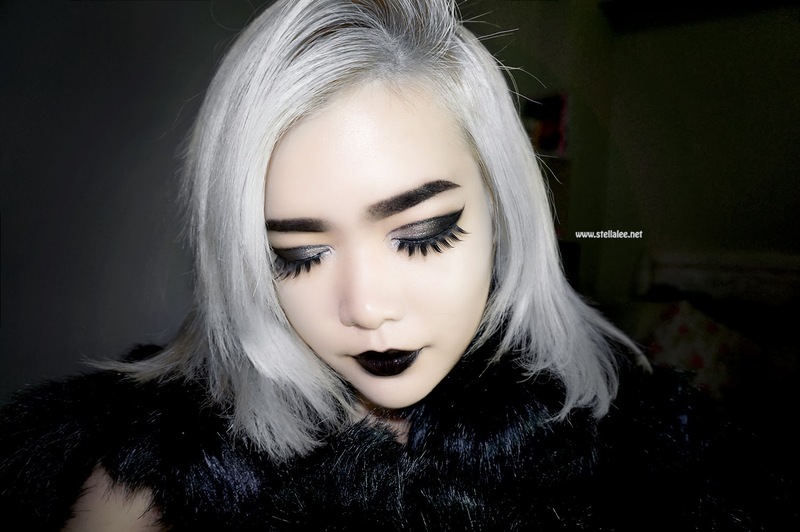 * love the edginess of your black eyebrows-light pale hair! i have dyed my hair before with a medium red colour, the colour dont really show properly? It's pretty! :D lovely tutorial..:D anyway what kind of hairdye did u use for that silvery hair color? thanks! My hair is dark brown / black. I want to dye it ash brown. Will it show up on my hair? I know this is a ridiculous question. But I've never dyed my hair to something lighter. Advice will help greatly! can i dye my hair electric purple without bleaching if i have black hair like you? I have black hair and want to make it a lighter brown Liese brand,what hair color should I use? No it will not color does not lighten color. I want to know, if i have a dark brown hair color and want to highlight it to become dark blue will the color stands out? or I have to bleach it first? What happens when ur hair is colored jet black and want medium dark brown ? I dyed my hair to black, i wonder if i can make it brown without using bleach? I'm scared of using bleach in my hair because it's thin and it might damage it pretty badly. any suggestion? I need help!! 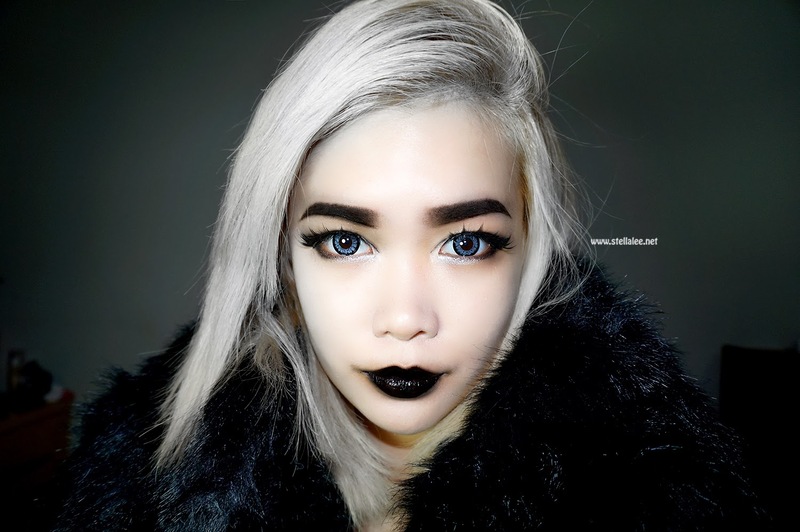 I am Asian have thick black hair, and I really want a medium ash... I have tried many times: I bleached my hair once and dye it ash.. I also tried dying it blonde.. but each time my hair turns out to be brown with hints of red in it!!! I hate the red, I just want the ash colour without traces of orange/red... but I don't want to bleach my hair again.. what should I do? emang dasarnya cantik n pinter make up yah..
Nice tips. thank you for that. I was wondering my hair is light brown and black in roots. I want to get the purple hair color without bleaching, what brand do u think would give a nice purple effect? I have black (Asian) hair and am dying my hair yellow. Should I dye my hair blonde and then yellow or go straight for yellow? well have natural black and thick hair but I want to dye it diferent vibrant colors.. im thinking about buying blonde hair dye, and the colors I want to dye my hair. but then after I dye my hair blonde dye my hair those colors.. will me dyeing my hair twice ruin it..? I have a medium red hair color and i want to dip dye it a vibrant/dark purple can i do that without bleeching my hair? I have lightish brown hair if I dye it with a really light blonde will it turn out in a dark blonde or will it just make my hair lighter? And that was meant for if I don't bleach it. Your going to have to use a color stripper which is essentially similar to the bleaching process. It strips the dye from the hair. Black is the most difficult color to work with in your hair if you expect to do a lighter color after, so in the future don't go black if you expect to have a drastic change right after, do a dark brown instead. If you'd like to diy the bleach there are different volumes of developer you add to the powder bleach which are like the "strengths" of the bleach. I've used 40vl. which is stronger but necessary since my hair is naturally very dark. Since you are worried about it breaking your thinner hair you should use lower or median number vl. of developer which also lightens slower but since you'd like a brown it might help just keep an eye on it to make sure you wash it out in time. I'm not a professional I've just had blue hair for 8 years, and have to deal with naturally thick dark hair :P.
If you buy a boxed blond hair dye with naturally black and thick hair it won't turn your hair a "true blond" and it will most likely still have the brassy tones in it (orangey blond). If your colors are light (lilac, light blue etc.) you'd be better off bleaching with buying a 40 volume developer (the stronger of developers, which will quickly lighten your thicker black hair) and the powder to get a lighter blond so the color has a lighter base to stick to. If you will be doing dark purples, blue etc. you might be able to get away with using a boxed blond but be wary, those usually don't get us dark thick haired girls a true light blond. You can bleach your hair, wash, let it dry (or leave damp if colored dye direct you to) and then apply colors (blue, red, orange etc). Adding a colorant after bleaching in my experience actually adds body to the hair that the bleach has stripped and is safe. So yes, you can bleach your hair, then add colors to it. What is NOT safe is bleaching your hair, then the same day bleaching over what has already been bleached. This can burn your hair, dry it out and overall damage it if it was already a light blond after the first bleach. Hi Stella. So glad I found your site. My daughter is from China and has long dark dark brown hair. She wants to dye it a coral / pink color. I took her to the salon but the girl is not very knowledgeable about Asian hair. She bleached it only once and the bleach did not remove all the color. Then when the color was put on it turned the hair a coppery color. It's pretty but not what she wanted. Does she need to continue to bleach it in order to get the color she wants? Will she ever be able to get it a pinkish color? hello, I have dark brown hair and I want to dye it grey with some purple,but I cant bleach it because my hair is to damage for that. how can I achieve the look I want without bleaching? I have black hair & I want it to be purple without bleach, do you think my hair could catch the color nicely? I also don't want it to look purple just in the sun. i have dark blonde and i want to do a ombre look but i dont want to bleach my hair because i hear it can mess your hair so bad. So i have been trying to find a way to get my hair lighten but not having to deal with it mess up my hair, and i dont know what type of steps to do the dark hair onces or the blonde once.